This is the gorilla. 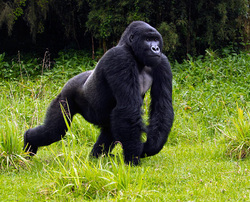 The gorilla is the largest and most powerful of all living primate. Gorillas are mostly herbivorous, which means they eat vegetables. 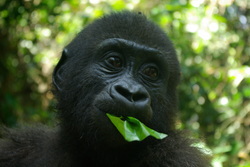 They enjoy eating the leaves and stems of herbs, shrubs, and vines..
Gorillas are covered with hair. It is short, soft, and very fine. I think they would be warm to cuddle with on a cold night. 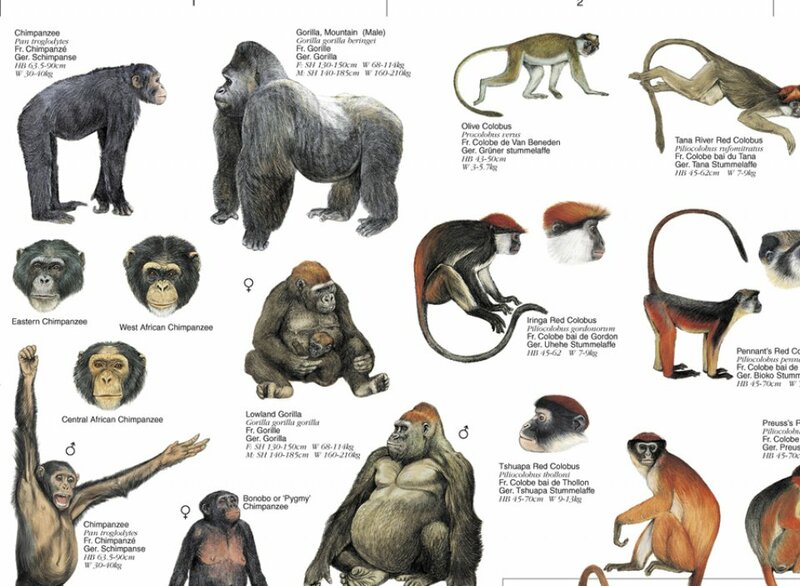 Like all great apes, the gorilla's arms are longer than their legs. When they move using their arms and legs, they knuckle-walk. Did you know they can run up to 25 mph? The gorilla sleeps in a nest up in a tree. Their nests are much larger than a bird nest! They like to sleep from about 6 pm to 6 am and if it's rainy, they will sleep even longer! Some gorillas get tired during the day and they will take an afternoon nap!